As the start of our winter Professional Development session approaches, it’s time for me to bite the bullet and shell out a bunch of cash for a pile of tablets for an App we’re developing. Teaching clinical teams how to use the app will be the focus of the first part of our upcoming workshop. The problem is the tablet-acquiring part is…a bit intimidating. At home, I’d search options on the internet and then probably order a few different options, which would arrive at the door with an option for 30-day free returns. 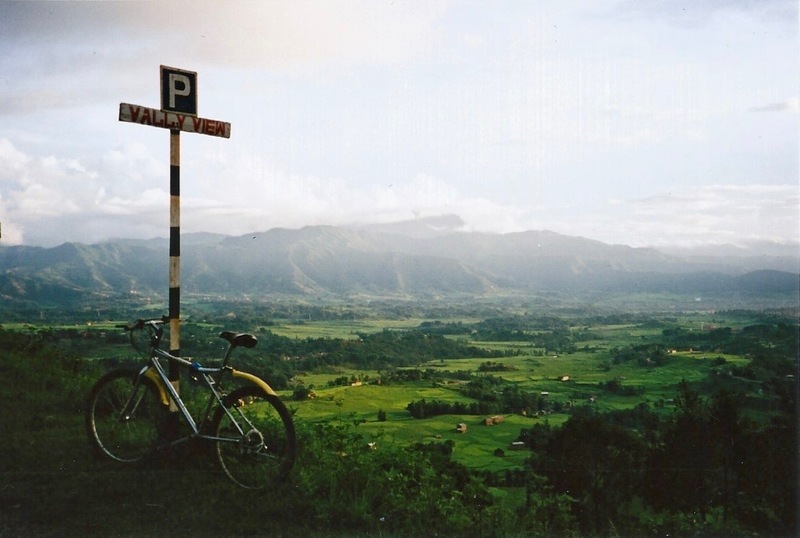 But I will shamelessly admit that when it comes to Nepal, I have no idea how to do this. I know how to do stuff that involves baskets, ropes, and misplaced stretches of mud…but I do not know how to do a normal officey thing I am in charge of, such as acquire some expensive pieces of unfamiliar technology. 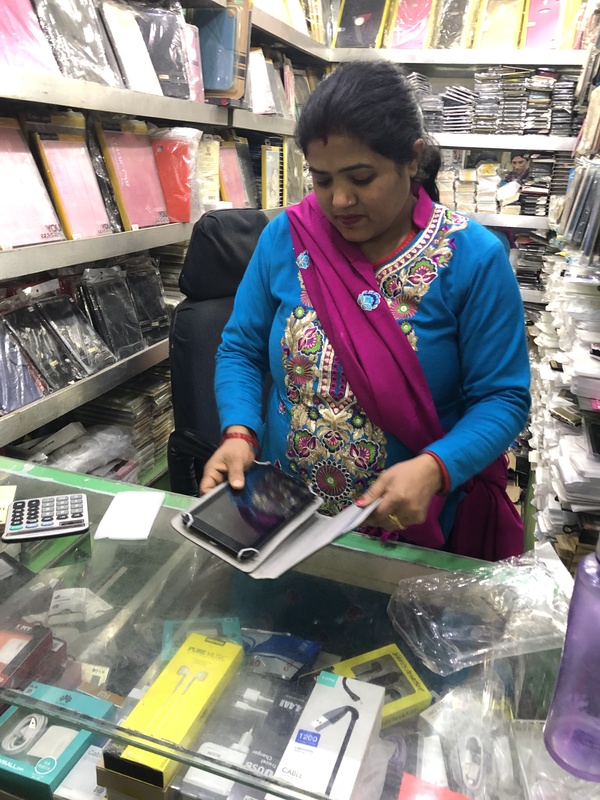 I asked Muna, our Program Manager Who Literally Fixes Anything, how and where one buys a pile of tablets in Nepal. We were hoping for something with a little flexibility on standard retail price, since we’d be needing 5-7 of them to start. Muna, did I mention she Literally Fixes Anything, told me about a site called Daraz.com where I could order things on the internet to my house. Or our office. I was floored. Internet ordering is a thing in Nepal? Where the heck have I been? Muna explained to me excitedly that they literally bring it TO YOUR DOOR. Right to your very own door! And then, you pay for it there. If you don’t want it, you return it with the courier. “You order it on the internet and a person brings it? But how do they find you?” I was pretty sure this wasn’t happening through the regular mail system. I just want to point out that, while a postal service certainly exists in Nepal, most houses don’t have street addresses, and a minimum of streets go by name (that anyone uses or that command street signs), and a large percentage of the houses and streets that do exist were only recently built, and in the majority of the country there are a minimum of streets altogether. 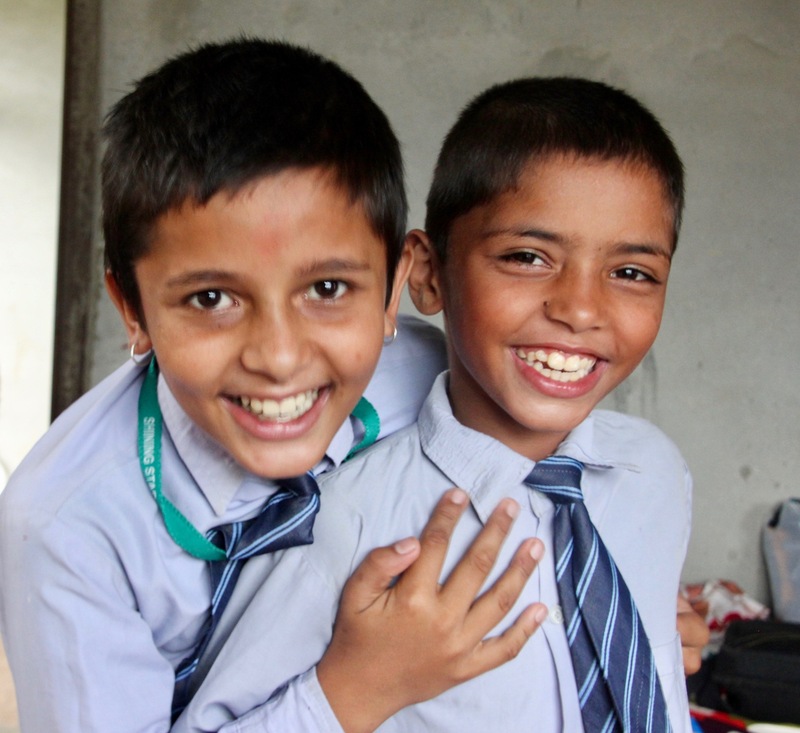 We looked on daraz.com and ordered five $280 tablets to Ravi’s office in Kathmandu. I arrived in Kathmandu a day later, a week before our training was to start, intending to return with both our trainer (Bethy) and the highly necessary tablets. By this time Daraz.com had called Muna, and Muna began relaying messages between the company, Ravi, and me. At first everything seemed fine. Then Daraz explained that they had the five tablets, but needed to get them out to a store where the courier would pick them up and bring them to Ravi’s office. Or my hotel. Or wherever we asked them to come on the day that they would call us, some time soon, having secured the assets through the official processes. “Are these going to get here on time?” I asked Muna. She knows things. Admittedly we’d ordered the tablets at the last minute, and even on-time things are almost never fast things. And I seriously doubt that Daraz often receives orders for a heap of five tablets at once. While the tablets whereabouts remained uncertain, Bethy did arrive as planned from Cambodia. We spent an afternoon with Ravi to map out our training plan for next week. By Sunday, I was starting to worry. 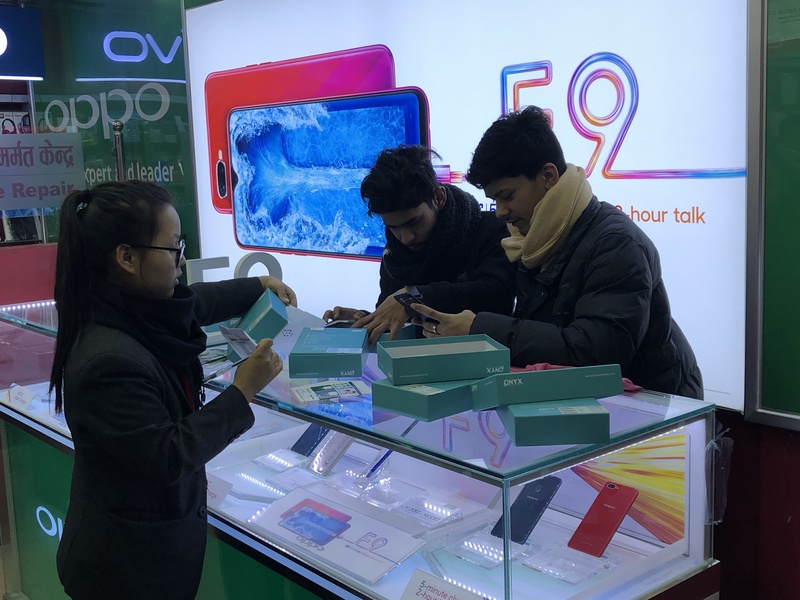 I started calling around in Kathmandu to see about buying some tablets from a show floor, something that in my mind was randomly assigned as a more feasible activity in Kathmandu than Pokhara. We ended up locating a completely obvious strip of cell technology stores around the corner from New Road. I called Muna and told her we were going on an expedition to find the tablets ourselves. “If I find them, we can cancel the order, right?” I asked her. 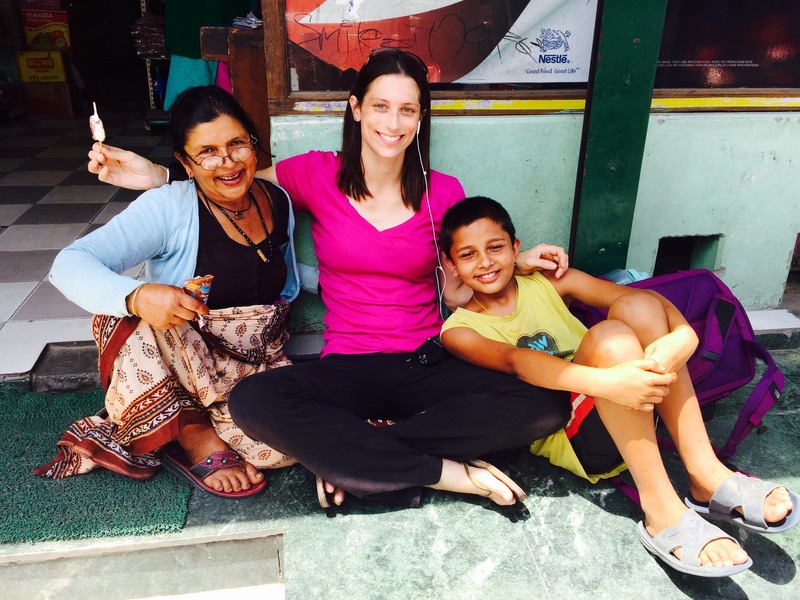 Just to be clear, I’m not telling this story as a lesson in how things don’t work in Nepal. To the contrary, this is exactly how things work in Nepal. The internet company wasn’t trying to give us the run around, they were just trying to figure out how to find a guy who could get his hands on the pile of pricey tablets we wanted and get them to our guy in a short period of time. Without street names. In a cash economy. Bethy and I set off to New Road to begin the in-person search. If I’d been more savvy, I’d have known from the start that we should have gone to New Road: as we rounded a corner, there before us, like Oz, was a fairlyand of Samsung and Oppo and Huwaei stores packed together for a block and a half. We walked in and out of them pricing out different tablets, including the one we’d possibly or possibly not ordered online, and when we thought we’d settled on a winner, we wandered in to one last alley for a final try. There we met Ravi #2, who presented us with our final and ultimately champion tablet, a simpler and smaller version than everything else we’d located. At about 40% of the price. “I’m a movie star,” Ravi #2 said. He is. Look him up. “Here’s a video of me,” Ravi #2 said offhandedly, handing us his phone, his Bieber coif spilling over his brow glamorously but without obstructing his vision. We bent our heads over the small screen, which showed our tablet salesman serenading a beautiful woman on a bridge. I withdrew a heap of cash from the ATM and forked it over. While five separate people bustled about unpacking our tablets in order to fill out warranty cards, add screen covers, and repack them, we waited and chatted with Movie Star Ravi. 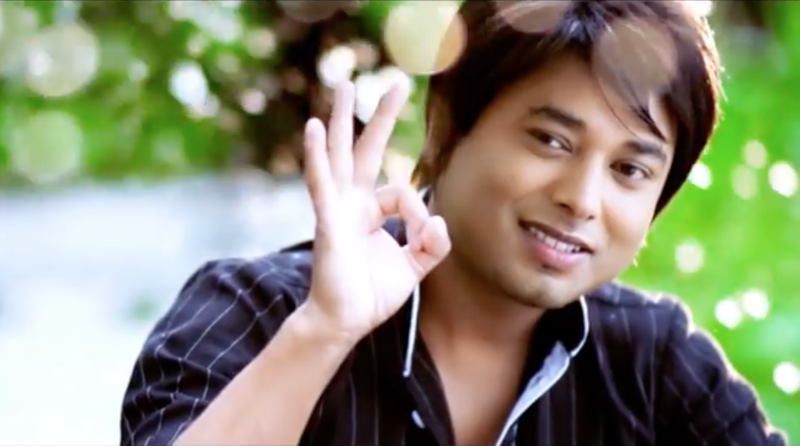 He reclined on his stool, a physically not possible thing that only Nepali movies stars can do. “Do you know my pal Mahesh? He’s a movie star also,” I volunteered. Why yes, Ravi #2 did know Mahesh, the brother of our field officer Gaurab (the human). Gaurab and Mahesh are both from Kaskikot and I’ve known Mahesh since he was a kid, and even produced a radio story about his robot-making career before he was a movie star with Ravi #2. 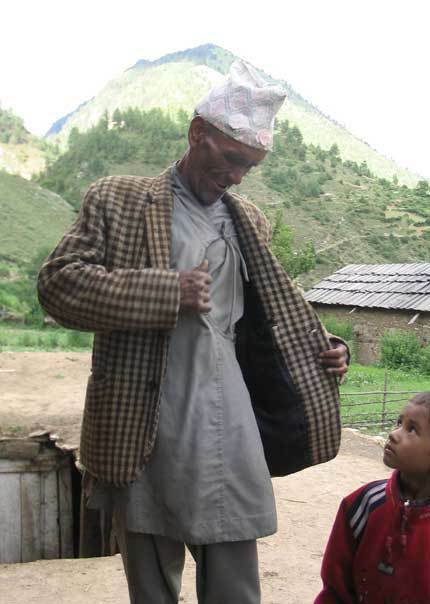 His father Thakur was one of the founders of Jevaia Oral Health Care back when it was Kaski Oral Health Care, a bazillion years ago. Ravi the Movie Star didn’t have any tablet covers, but he gave us the name of a shop in another part of the city about a mile away. Obediently I put it in my GPS and Bethy and I set off at a fast clip, racing against the gathering dusk, the new tablets in my bag. 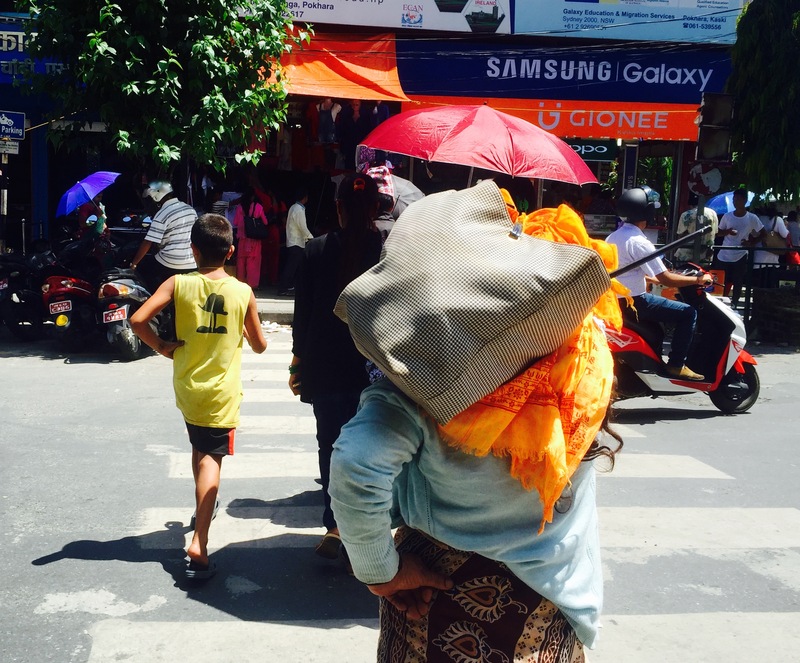 In no time the main thoroughfare of Cell Phone Oz had narrowed, then faded away behind us and deposited us in to the heart of Kathmandu’s old, cloistered Newar alleys. Ornate wooden windows leaned precariously in over our heads, while vendors presided over every vegetable and shoe and devotional item imaginable, and as we dashed alternately through crowds and crowded passageways it seemed unlikely that we were headed closer to tablet covers. Night fell, and the cobbled paths and squares became lit by yellow squares falling out of spice stalls, flickering lamps dotting the pavement where vendors had spread out their treasures. We sped through, dodging colored blobs in our path like marbles rolling through a game. Out the mouth of a maze we arrived, suddenly, at the destination on Ravi the Movie Star had directed us to, and Lo and behold, there before us was a shop with exactly the name he had provided. It sold a lot of stuff, but none of the stuff was tablet covers. And there it was. Bending off the laid stone path and its hoard of pounding feet was a harshly lit corridor of electronic gadgetry shops that contained four bazillion types of cell paraphernalia. At the end of it, positioned in such a way that suggested anybody arriving must surely be doing so at the end of a great pilgrimage, was a casual shop crammed with phone covers. A woman sat among them as if, obviously, we had been on the way and due to arrive at some point, whenever. Inexplicably, she had only one type of tablet cover, in one size, and it was a size that fit our efficient little mini-tablets. “We’ll take five,” I said. We packed them up, shoved them in our now very full backpacks, and set off on the last part of our expedition through Bishal Bazaar and Ason, butter lamps burning what seemed like everywhere in the lively chill. “Where did you find them?” she asked. The first thing I have to do is convince Aamaa to wear one of her new kurta salwaars. She has spent 60 years wearing a more dignified sari and she’s shy to dress like a girl. I insist she will be a lot more comfortable on our 24 hour journey with trousers on. Bhinaju and our cousin Laxu come to the airport with us. As we stand outside the door to the airport, again there seems to be a strange inversion of everything. We say goodbye and move in to the 24-hour netherworld of air travel, but the moment when I detach like a raft in to the sea, alone and timeless until landing back in the rest of my life, never comes. Instead, all my focus is on Aamaa while we pass through various inexplicable passages and security checks, making goodbye phone calls along the way. We end up seated with Chandrakala, a charming woman probably in her mid-forties leaving Nepal for the first time to go be a maid in Greece. I explain everything from the seatbelt to how to order drinks and use the bathroom. I set up their personal TVs with films for them to watch. They both look disapprovingly at the glass of wine I ask for, so I make a point of asking each of them repeatedly if they would like some wine during the flight. Aamaa has a million questions. Is it night or day? Can I put my passport away yet? Are mom and dad awake now? I don’t know. I’m used to not thinking about any of these things. I lead Aamaa and Chandrakala didi to the sleeping room and we all try unsuccessfully to doze off. Aamaa and I both end up stretched out on the floor instead of the awkward lounge chairs, and I appreciate how we must look, sprawled out on the ground in a room full of disciplined travelers using the chairs. We go to the bathroom and use an automatic hand dryer. 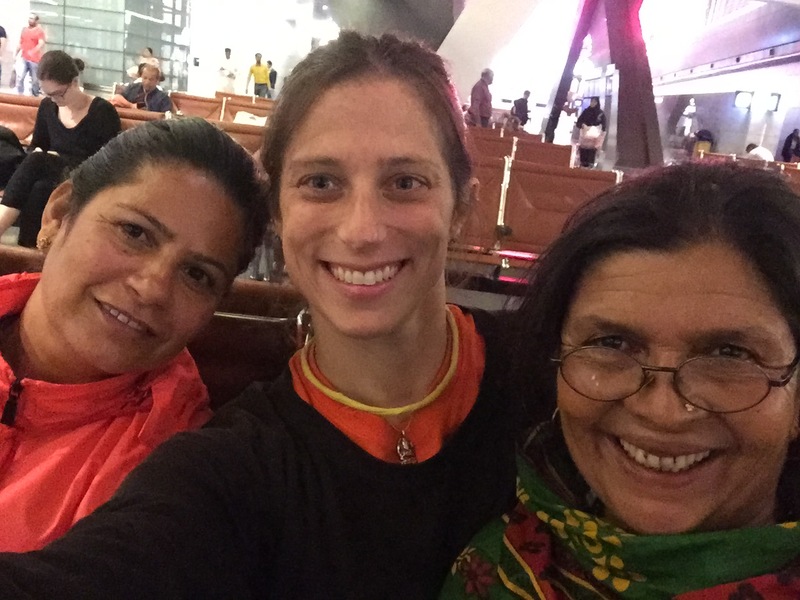 By now we are all aware that we’re going to have to abandon Chandrakala didi to the Doha airport when our flight leaves for New York. 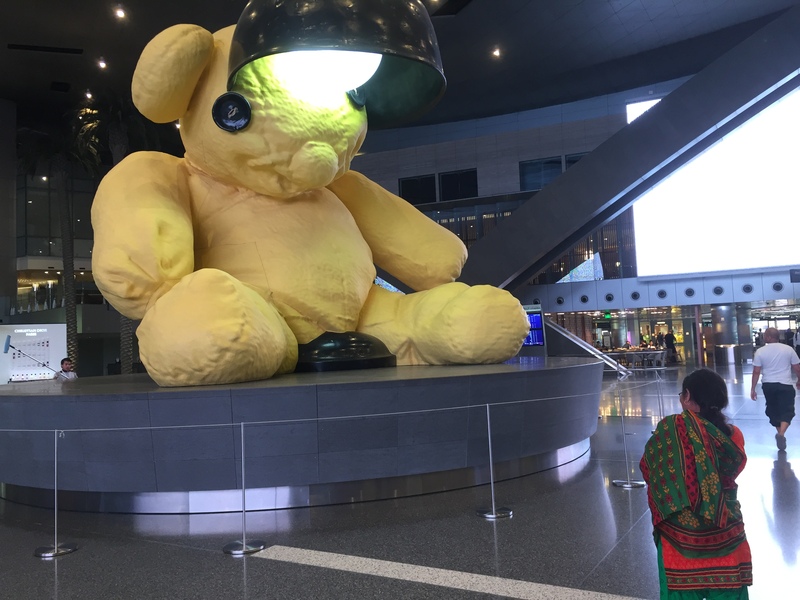 I take us out to the nauseous teddy bear where a bank of monitors will show Chandrakala’s departure gate when the time gets closer, and explain to her three or four times how she’ll navigate the list of English symbols. Chandrakala didi is literate but uncomfortable with English, and if you don’t know what a gate is or how an airport works, reading the monitors is just one obstacle (how do you even know you’re supposed to read a monitor?). There are many Nepalis working in the Doha airport and we chat some of them. Chandrakala didi will be able to ask someone if she needs help, but it still feels wrong to leave her alone in the glowing Doha airport with its mysterious halls and signs and statues. Eventually we have to say goodbye, and she sits outside our gate watching us go. Every time Aamaa and I have to pass through a checkpoint or security screen, the international airport staff first assume that we aren’t traveling together, and then want to know what in the world is going on. Aamaa has all the looks of a first-time traveler from a traditional part of Nepal, and in addition to the fact that I have all the looks of a private-school educated white suburban yuppie from Connecticut, I tower over Aamaa by about eight inches. Since she doesn’t speak English, I usually have to translate instructions. 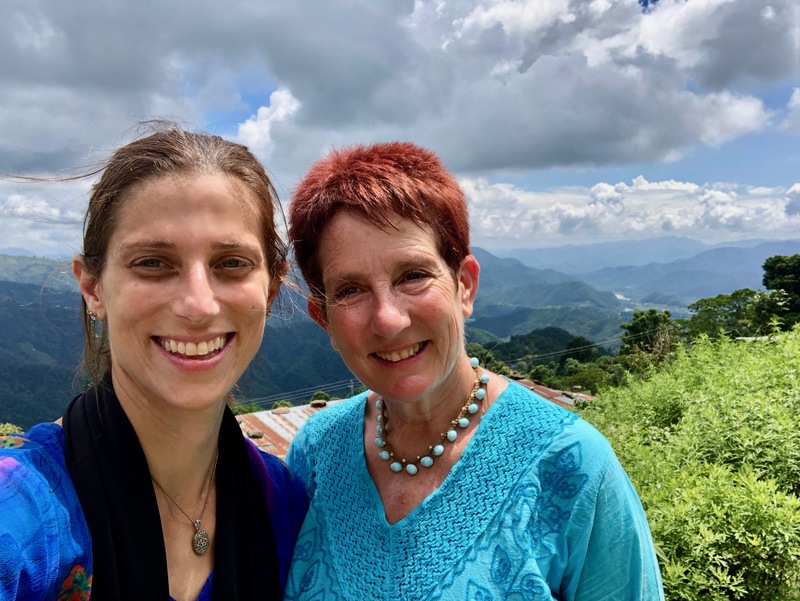 After figuring out that we go together, most people assume I am her daughter in law, which would explain how I know Nepali and why I’m the one shepherding her on an overseas journey. “This is my daughter!” Aamaa giggles as she corrects enthralled security guards and airline attendants. We make our way from counter to counter and checkpoint to checkpoint, crossing the globe in a little bubble of delight that we make no sense. Finally we board our fourteen-hour flight to JFK. We get incredibly lucky with an empty middle seat on a mostly full flight, so we’re able to take turns properly sleeping. I was worried about how Aamaa would handle strange food made by unknown people, but she mostly exclaimed over amount of it, approaching each tray with curiosity and then asking me if I wanted to eat her pats of butter because she was full from the continuous flow of food. And then the next tray would come and she’d ask me if I wanted the butter again. 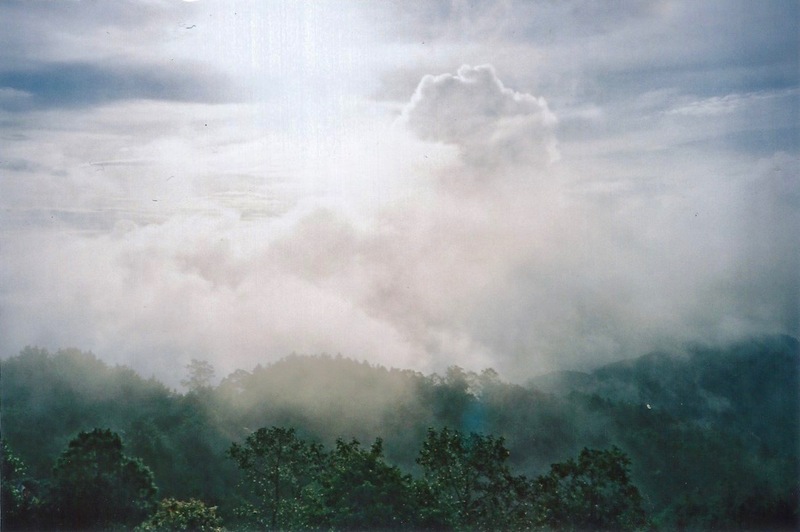 We peered out the window at the rolling white puffs lolling off to infinity and Aamaa asked if the clouds were the ground or the sky. “Does this plane also go to the other skies?” Aamaa asks, long after we’ve lost track of night and day. Many trays and questions and naps and pats of butter later, we break through this sky and New York comes in to view. 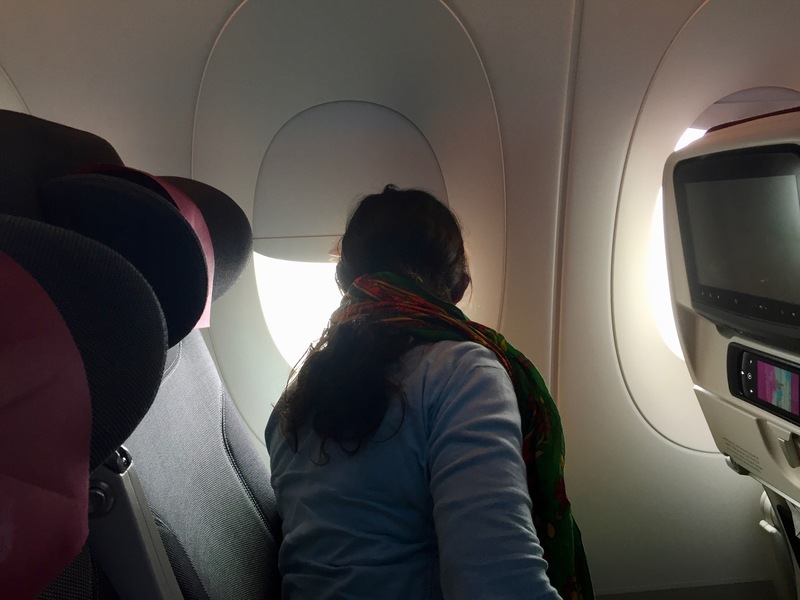 Aamaa reaches behind her for my hand as she stares out the window, and with a dramatic rumble, the plane sets us down on the ground. The morning we were leaving, Aamaa’s brother and mother come over and we ate together. Aidan and Pascal were looking unacceptably dapper in their school ties. I can barely stand it when they look like this and it shouldn’t be allowed on these mornings when I’m leaving the country and won’t get to see them for five or six months. Didi accompanied Aamaa and me to the airport, and while we were waiting for the flight to arrive, we made our first stop in a public bathroom. I showed Aamaa how to use the faucet at the sink (actually, the entire bathroom is a mystery), and what I hadn’t realized yet was how many different kinds of faucets there are between Pokhara and Hartford. Finally it was time to say goodbye to Didi. We went through security, and now it was just us, on the road. We climbed in to a small commuter plane for Aamaa’s first airplane ride. 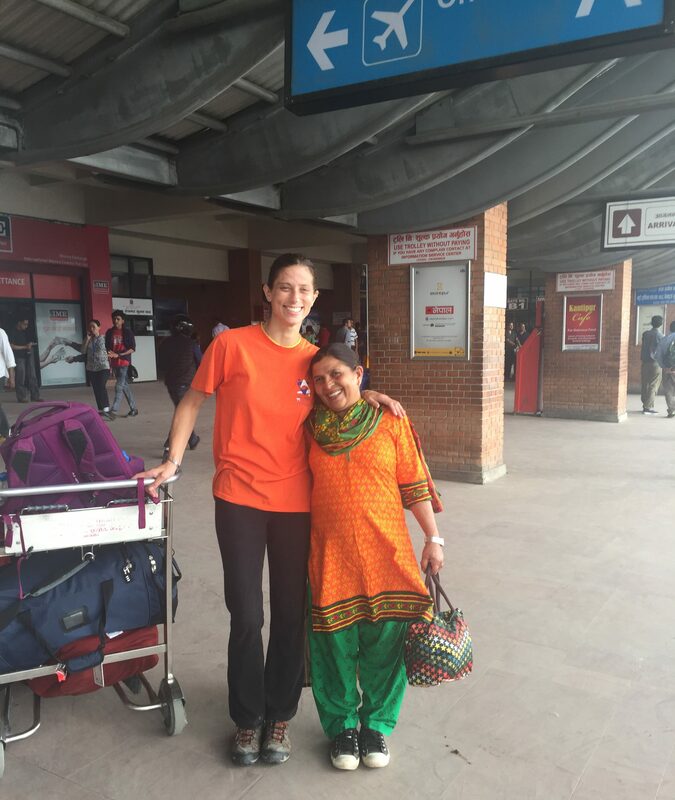 Aamaa had only been to Kathmandu once before, when she picked up her visa a few months ago. We arrived at my friend Aparna’s house and Aamaa said wanted to accompany me to my meetings. I was afraid she’ll be bored. Why should she sit around, she wanted to know, while I go do things in Kathmandu? Let’s see the city! Let’s see what I do when I’m here, doing all these meetings, she said. My first meeting was with a Berkeley professor in a coffee shop. I ordered Aamaa a salad. She poked at it suspiciously. “Uncooked spinach,” she pointed out. “It’s a salad,” I offered. “Raw leaves,” she sighed, and switched over to helping me with my French fries instead. We arrived in the mall lobby to find, to my great satisfaction, AN ESCALATOR. 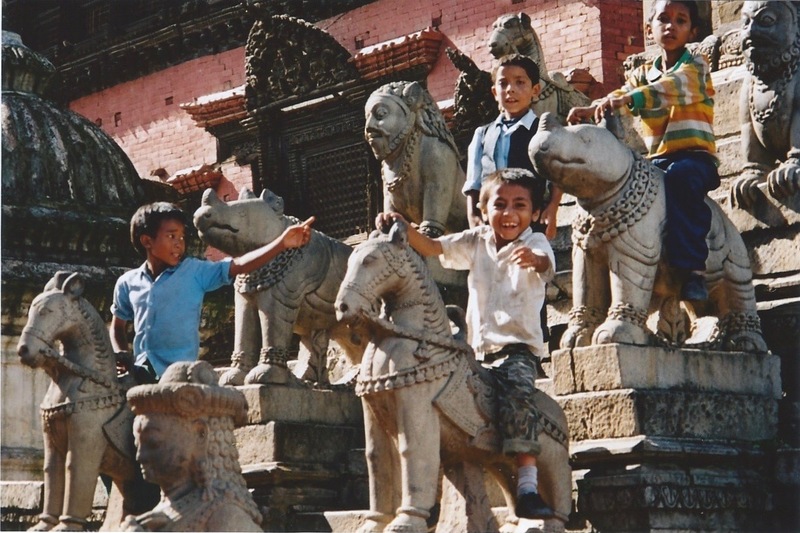 I convinced Aamaa to ride it, leading to one of my favorite pieces of Nepal footage in fifteen years. The escalator, I am pleased to say, is followed by a ride on a glass elevator. We stay on the rooftop as dusk settles, eating appetizers and gazing out over the city, which stretches off smoggy and hazily lit. 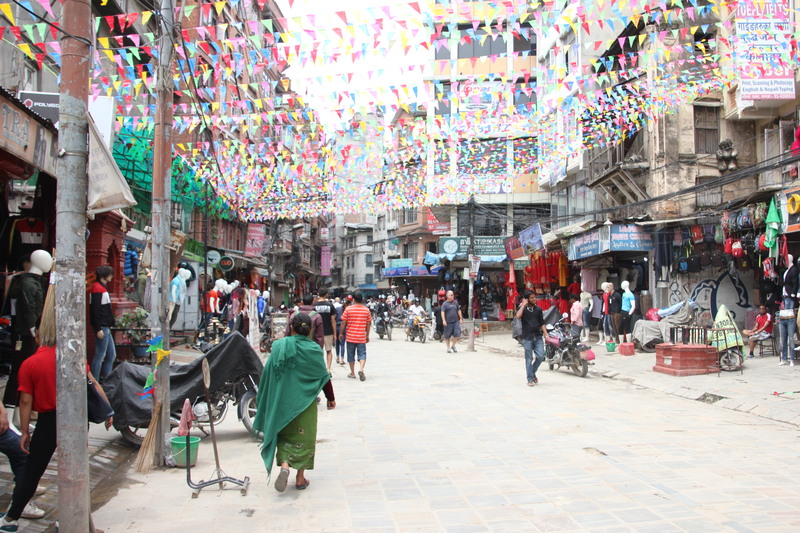 The next day, we will do some shopping in Assan Bazaar. Aamaa needs a few pieces of clothing, and I need a container to burn the incense from Solukhumbu that Sonam sir gifted me when I bought his tea yesterday. 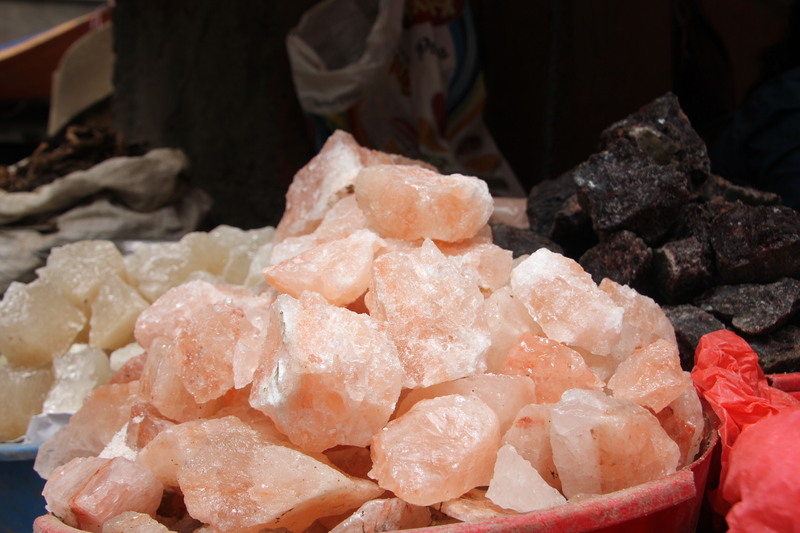 Prem Binaju is in Kathmandu with a client, and he’ll guide us through the crush and throng of shoppers and vegetables and piles of Himalayan rock salt. We only have one night in Kathmandu. I wake up in Aparna didi’s house to early morning light filtering through the sheer curtain as street sounds muffle their way in to our room. Aamaa is lying on the other bed, a place I never ever find her in the morning, because she gets up hours before I do to milk the buffalo, start the fire, heat water, and prepare for the day head. 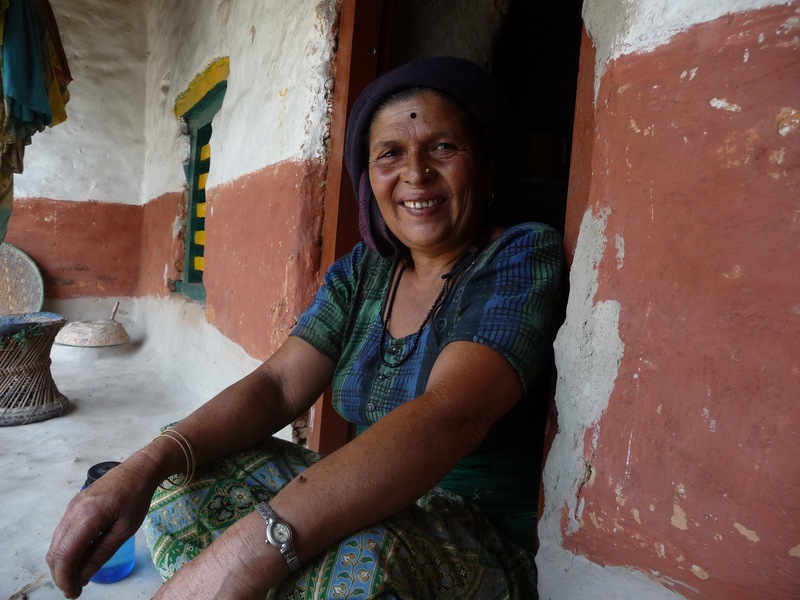 I try to imagine Aamaa’s life as it was back then, when the water springs in Kaskikot weren’t concrete taps but delicate pools that stirred up silt if you took from them too quickly. As a girl and young wife of 13, she sometimes had to sleep overnight in line while other women had their turns gently lifting the water jug by jug. 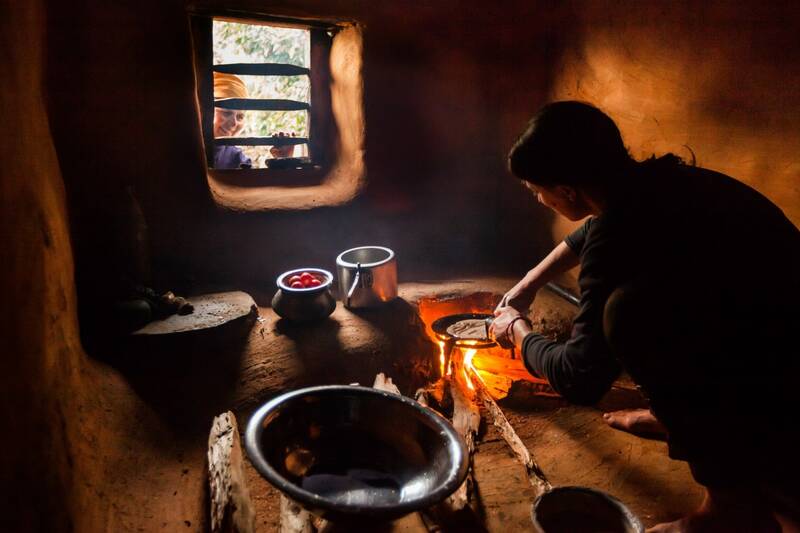 By the time Aamaa was 22, she was a widow with two young girls of her own, and it would still be years before a bus came to Kaskikot, or a door was put on the entrance to her one-room house. There have been many impossibles in Aamaa’s life. 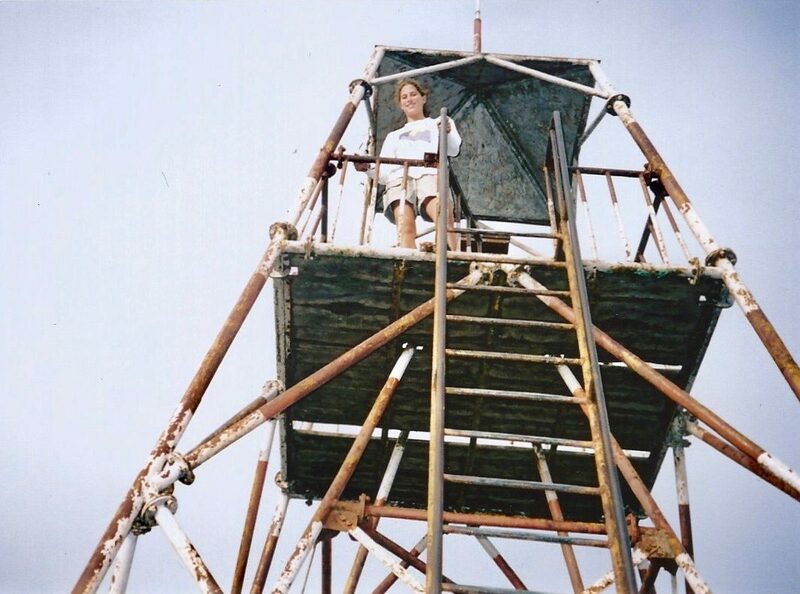 She raised two educated daughters who could split wood and carry twice their weight by grade school. The civil war started, but it was elsewhere, in other villages. The electric mill came; the bus came; the tourists came; other people converted their houses to homestays and restaurants. Aamaa’s house is off the road in a cul-de-sac of mountainside that nobody wanders past by accident. Even after some foreigners bought the patch of land on the hill behind the house and built a fancy hotel there, passers-by from Korea and Israel and Japan and Australia hiked past with their eyes straight ahead on the sprawling white peaks, rarely looking down to notice Aamaa and Didi and Bishnu there in the sunny yard, drying grain. The likelihood that I would wander through the door one day has always seemed both insane and inevitable. And over the last fifteen years, I’ve mostly thought of my life opposite Bishnu’s. We were the two girls born at the polar ends of the universe, the ones who looked at each other and thought, what if I were her? 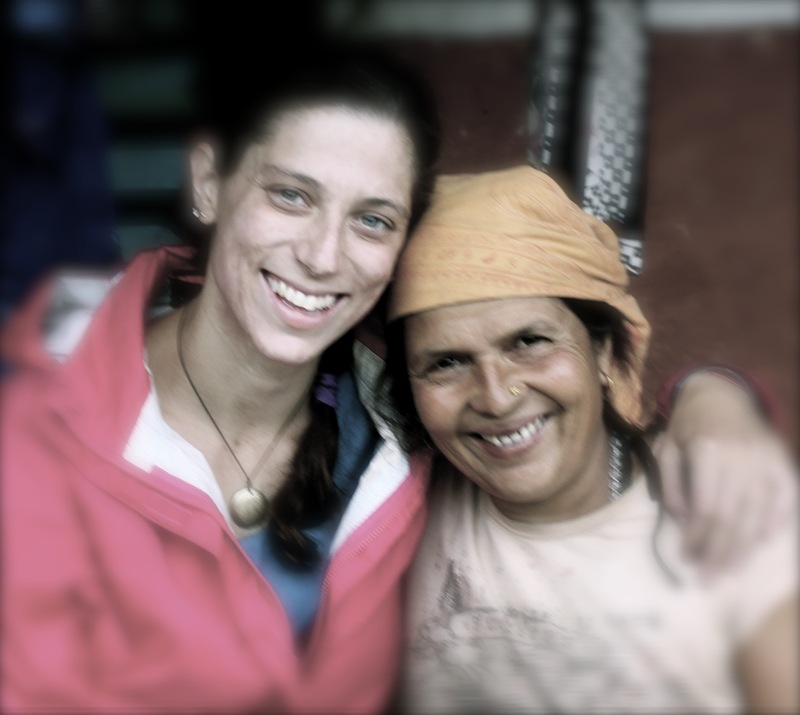 She’s been in the U.S. for eight and a half years now, while I spend significantly more time in Nepal than she does. Aamaa was always more like the soil: everywhere, earthy, constant, essential. She has all the nutrients and produces all the food and water and shelter. Aamaa keeps the house alive, the field and gardens fertile from cycle to cycle, the fire crackling. No matter how many people show up, Aamaa feeds us all. And no matter how many people go away, no matter how empty this house gets or how many of her birthdays pass, she keeps the water jugs full and the seeds sorted in dusty bottles. Aamaa has spent five decades in this village. I had no idea Bishnu had applied for Aamaa to get a tourist visa to the U.S. to see Bishnu graduate from her Master’s program in information technology. Nobody told me that Prem and Didi took Aamaa to Kathmandu for the very first time last May to go to the U.S. Embassy, or that on the way there, Aamaa didn’t eat any cooked food because she couldn’t be sure who had prepared it. 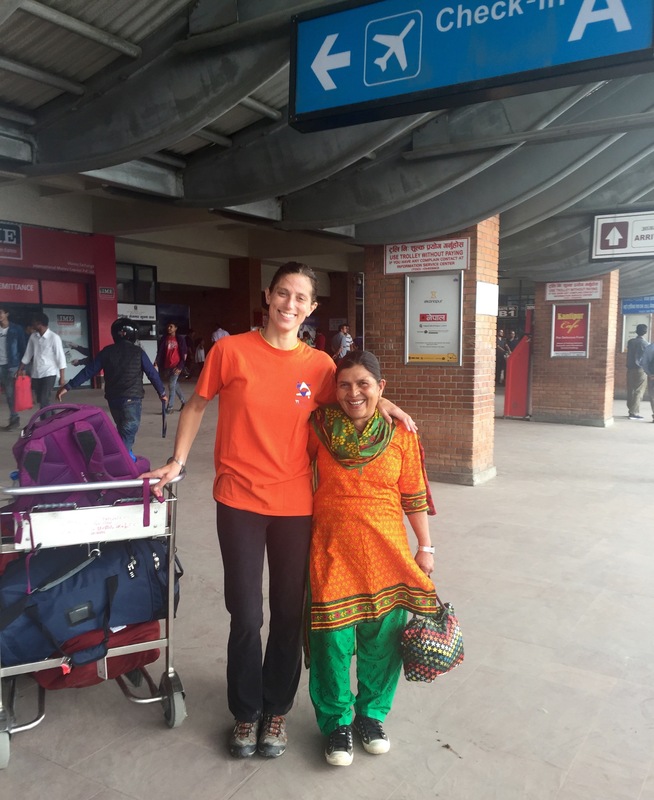 A few weeks later, I answered my cell phone in the parking lot at Walmart, and Bishnu announced that Aamaa had been given a five-year multiple entry tourist visa to America. “For my graduation!” Bishnu explained ecstatically. She hasn’t seen her mom since 2013. This explanation failed to explain all the questions I couldn’t think of. Obviously the idea of having Aamaa make this trip has floated through my brain millions of times, but it was the ultimate what if ever. The craziest version of everything. Part of me thought that maybe this was all kind of a whim – a thing that might happen next year, or something. But Aamaa had sold the buffalo within a week. 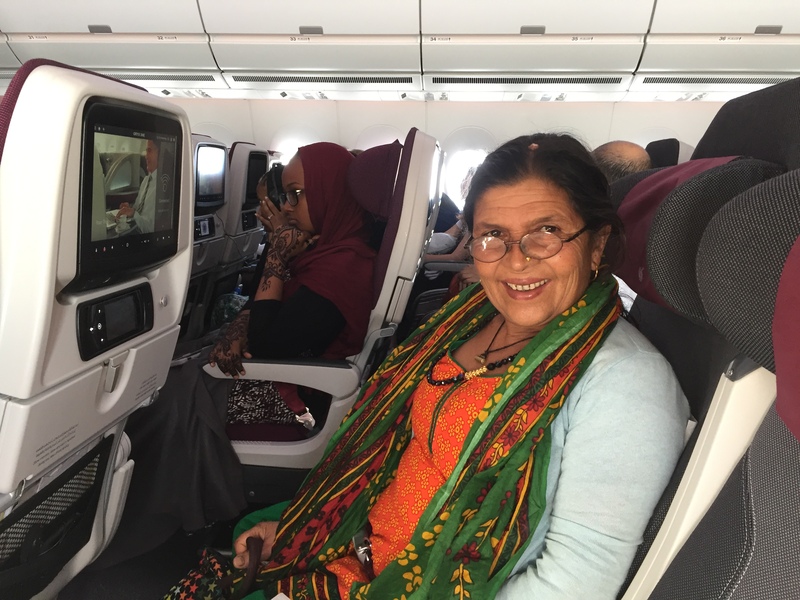 On my way to Nepal in June, I tried to imagine having Aamaa with me on the way back. First I tried to digest the most obvious and superficial matters. 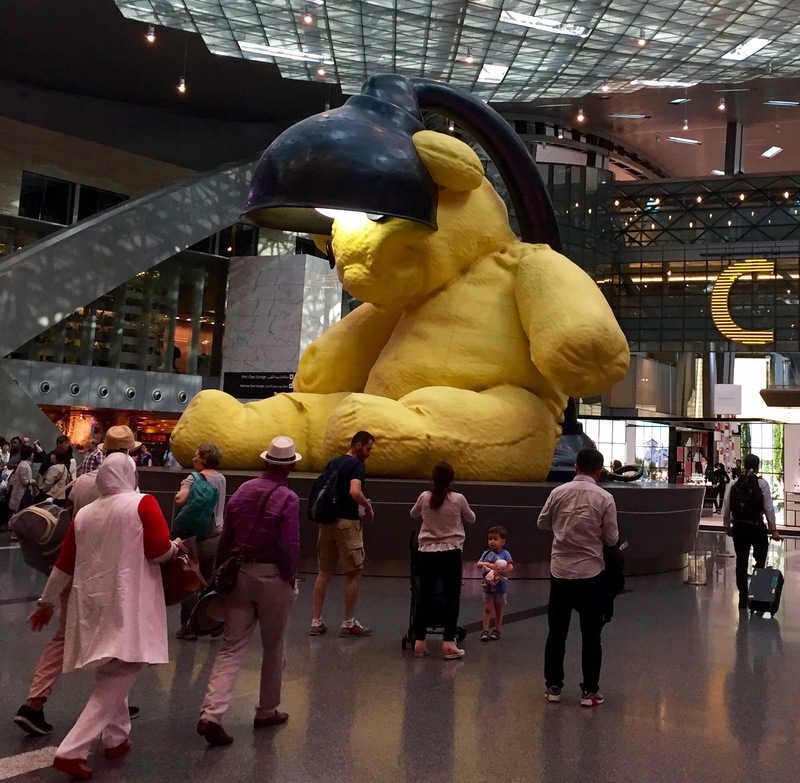 For example, how would I explain the enormous statue of a teddy bear bent over with an apparent stomachache dramatically bottom lit in the Doha airport? I can’t even explain that to you. Only Aamaa and I seemed cautious and uncertain with our excitement. The whole thing is so surreal that even the discussion feels like an entirely new and foreign continent. For fifteen years Aamaa and I have had what is now a very well established routine: I come to Kaskikot, we eat together in the kitchen, we go plant things with neighbors and churn milk and carry water from the tap, I fix up some things that need fixing in the house, we gossip about family here in Nepal and all the far away people not in Nepal. Aamaa knows them all – my whole extended family and a good number of my friends who have been to visit – largely through stories. But she’s the stable point, not just for us, but for herself also. “So we’re going to America, huh?” Aamaa says as we are sitting on the porch, as if testing out the statement. We stare out at the tall curly corn stalks, crowding out the grassy millet that’s planted between them. “Pascal, do you know how many states there are in the U.S.?” I ask, and he doesn’t know, so I explain again about Virginia and Maryland and Connecticut and North Carolina. 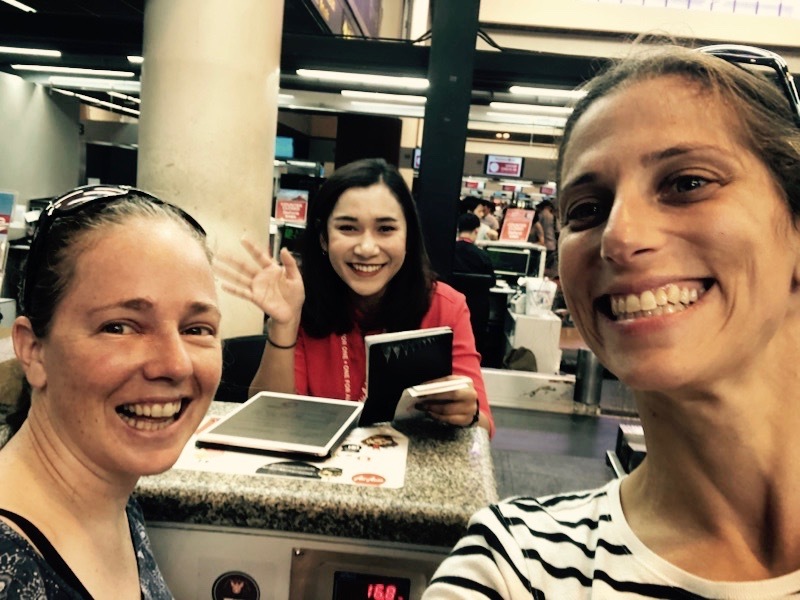 We discuss departure dates because I have to change plane tickets that currently have me going home from Cambodia, where I’m visiting Bethy in August; Amaa knows Dr. Bethy, because she’s been here too. We mull over how long Aamaa’s trip to America should be. A month would probably be good – she might be bored after a month? “I’ll go after cutting down the corn, and I’ll come back to cut down the millet,” Aamaa suggests with sudden firmness. That seems good, I agree. That is more orderly – maybe because we can see the corn. Long silences. What, exactly, should we should be planning? 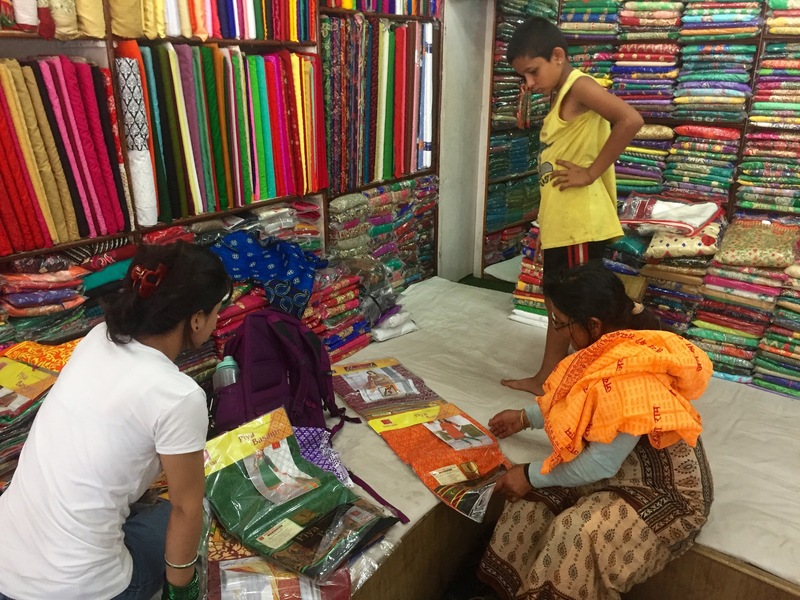 “Nah, you should just pick something out and I’ll meet you at the tailor,” Aamaa adjusts. 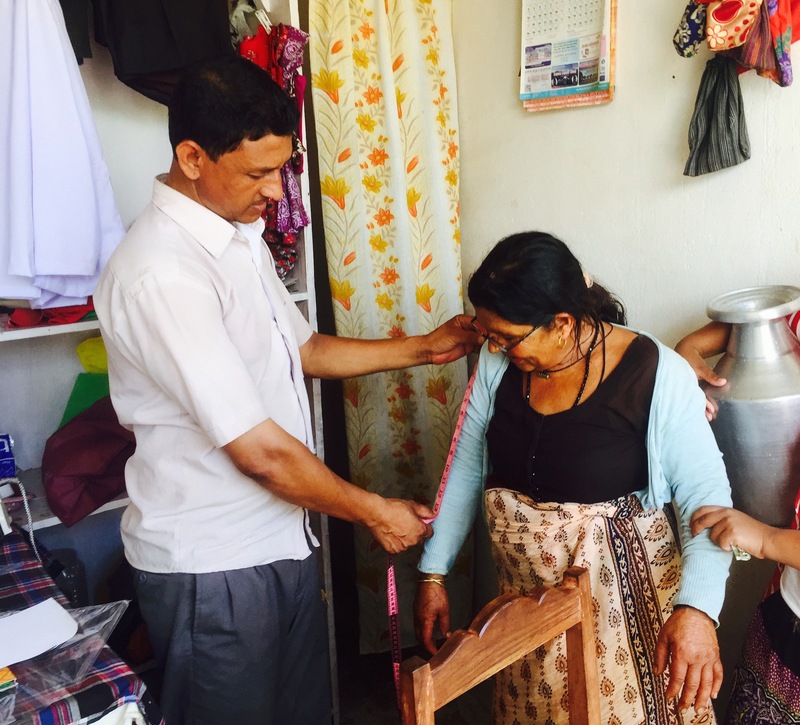 “I don’t know anything about picking fabric.” Honestly, in sixty years, Aamaa has never walked in to one of Nepal’s fabric shops and picked out material for an outfit, which is how literally everybody in Nepal gets their clothes. “No no no,” I insist, “I think you should definitely get to do the fabric choosing. Pick your own color, something you like.” I have to talk her in to it. A few weeks later Aamaa takes the bus to Pokhara and waits for Pascal and I to come meet her at a chautara in Chiple Dunga. She can find her way to Didi’s house, but for the most part she prefers assistance to get around the city. Between the three of us, Pascal is the only one who can properly read in Nepali. We set off up the road to go to the fabric shop. “Laura chiama, let’s have some ice cream,” Pascal suggests wisely, because I am the sucker who will pretty reliably buy us all ice cream. As we pay, Aamaa has sat down on the low wall at the foot of the store, which is not a seating area, and Pascal and I go with it. I hand Aamaa her first ice cream cone. “Do I eat this bottom part, the biscuit?” Aamaa asks. “Yes, but don’t eat the paper,” Pascal instructs. “I’m not going to eat the paper,” Aamaa says. I can’t even remotely transpose any of this to Connecticut. I ask a passer-by to take our picture, and as you can imagine, she looks at the three of us – the Aamaa who has very obviously just beamed in from the village, the entirely incongruous American, and this regular Nepali boy being raised in the city – and gets a huge grin as she takes our picture. What could our story possibly be? We set off again. Aamaa has brought along a broken umbrella from the house. “Laura, where’s a place that we can fix this umbrella?” she asks. I blink, there must be an answer to that, but I’ve never thought about an umbrella-fixing place. “We should probably just replace it,” I say, feeling guilty for my wastefulness and mental laziness. I don’t have the energy to try to figure out where the umbrella fixer might be and there’s really no excuse for it. As we wander to the center of town I’m distracted and disoriented because everything is inside out. When I first came here I couldn’t say a word or do a single thing for myself, and in Kaski, Aamaa runs everything. We get a few kilometers off her turf and suddenly she is the foreigner and I’m the one who knows what we’re doing. She has also brought with her a heavy bag of cucumbers and other items for Didi and Bhinaju and the boys, and she’s carrying it on her shoulder, the way people do in the village where nothing is flat. Pascal is twelve and he goes sprinting out in to traffic as we cross the street and I pay him no heed whatsoever because I’m dodging people to keep eye on Aamaa, having no calibration for how much I do or don’t need to hover over her in traffic. We probably haven’t walked through the city together more than two or three times in a decade and a half, and never just us – not once. We arrive at the fabric shop. There are hundreds of colors and textures of cloth to choose from. Aamaa looks hopeful that I will take over. As a young man begins removing options from the shelf she bends over them. He throws one on top of another and another and another and another. Her hands settle on a jubilant orange outfit. “I like this one,” she suggests. She looks at me as though asking if that one is a good one to like. Within ten minutes, Aamaa and Pascal and I are pawing through dozens of kurta salwaars, trading opinions on what Aamaa should wear in America. She picks two, and we take them to the tailor, who takes out his tape measure. He’s going to make something just for her, in her size and shape, to wear between the corn and the millet. “I don’t know – I think they should be a bit longer. To the elbow,” Aamaa says. The tailor agrees – maybe longer sleeves for an Aamaa. No way, I say, short sleeves look best on a kurta and it will still be hot in September. Aamaa studies her arms for a minute, apparently imagining them in a very standard piece of clothing she’s never had. The bus to kaski is very hectic right now: in addition to the heat, and the rain, the road has been sporadically damaged by flooding and landslides. After last week’s sweltering ride with Aidan and Pascal, I decided that this afternoon I would try getting a ride with Nabin who lives up in Parapani and drives a taxi. He’s always willing to drive me home at the end of the day for a pretty good price, rather than drive his car back up to Kaski empty. I called Nabin on Tuesday to fix our plan, and then rang him up again as we were leaving the office at 5pm on Wednesday. He picked up, but the connection was bad and I couldn’t catch what he was saying. I decided it was “I’ll call you right back,” and then I hung up. I texted to say I’d be ready at 5:30, and went back to my room to putter around on the internet for a while. I called Nabin at intervals but he didn’t answer. The clock drifted past 5:15, then 5:30, when the last bus leaves from the bus park for Kaski. At 5:45 I thought, I better move out if I’m going to get to Kaski today. 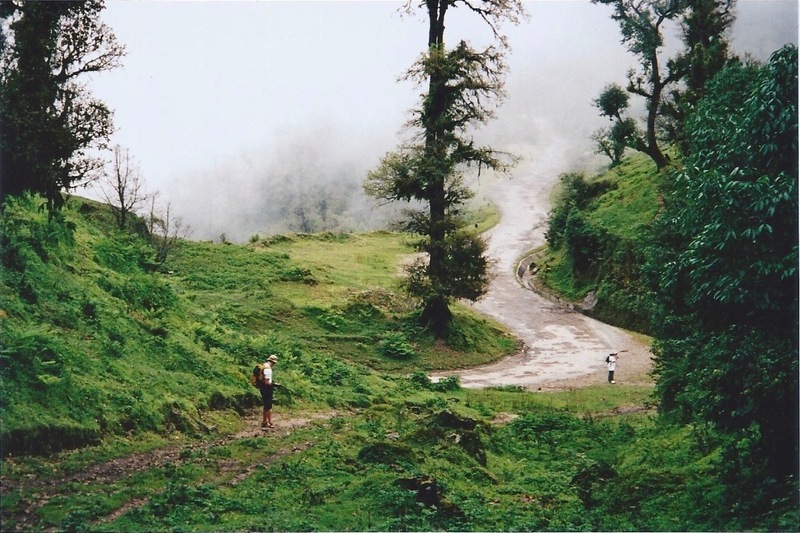 If I couldn’t get a hold of Nabin, I was already stuck making the hour long walk from Naudanda – potentially in a downpour, in the dark – because the last direct bus had left already. I put on my backpack and walked out to the main thoroughfare running to Lakeside. One advantage of being a foreigner is that you can do things like stop a random guy on a scooter and say, “Hey, would you mind just taking me up to the next intersection?” I stopped a random guy on a scooter and asked him to take me up to the next intersection. I hopped on the back of his bike and as we approached the intersection, I shouted over the wind, “So where are you headed?” The guy was headed straight on to Pirthivichowk, and the bus park was up a road to the left, so I thanked him and said I’d hop off there. “Oh what the heck, I can take you to the bus park,” the guy said, and turned left. I’ve never tried this strategy for lift-getting before, ever. As we drove up the road to the bus park, the guy said he’d served with the US Navy in Bahrain for eight years. I didn’t even know that was a thing – is there water in Bahrain? 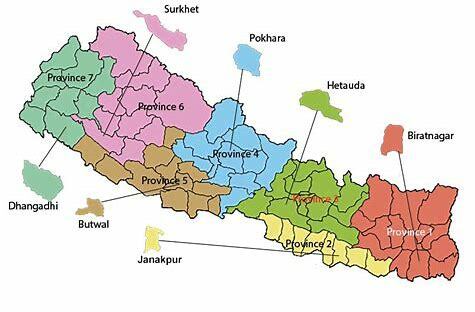 – how to Nepalis end up in the US Navy? – and he told me more about it, but I couldn’t hear him over the wind in my ears and the honking traffic, so all these things remained mysteries. Back in Nepal, he wasn’t doing much at the moment, he said. “So where are you headed?” the US Navy guy asked. I explained about Nabin, and about getting to Kaskikot tonight, and that I supposed I’d walk from Naudanda. “How much will it cost?” I asked, wondering if that was the least of the confusion. “Ok, let’s go,” I said. I determined to give him some gas money, at least. Also, I have a black belt in taekwondo. For the next half our or so, we rode up the switchbacks, watching the valley recede in to the hazy, rose-tipped blue of evening. The day fell away below as we climbed up in to the hills. I cinched the hood on my rain jacket to provide a little wind protection, but the guy was a reasonable driver and the breeze from the movement felt good. Occasionally I stuck my arm out in the direction of the beautiful scenery, as if it was some kind of compensation I could offer for this inexplicable act of generosity. We came upon a sloshy patch of suspicious looking mud and disembarked. The two of us regarded the scene: a pit of soft mud with the gash of a thick tire through it, left by something much larger and heavier than the scooter, and surrounded by pools of brown water. The guy looked concerned, partly with the matter of my walking, and partly with the oppression of humans by an inert patch of mud. “Please let me contribute something for gas,” I offered. He declined. He had time on his hands and it was a pleasant trip. I thanked him, asked his name, and we took a selfie. Raj Kumar Gurung. A motorbike came up behind us with two young dudes on it. They sped over the mud pit. Raj Kumar Gurung looked from them back to his scooter. “Let me just give it a try,” he said. Raj Kumar Gurung, US Navy, revved the scooter and launched it in to the mud pit. It rolled through to the other side. “I’m coming!” I said, and stepped directly in to sucking mud-slosh the consistency of hummus up to my ankle. “Be right there!” I cried, rinsing off some of the brown hummus in a puddle, and then in a clear stream that had had developed across the road on the other side of the mud pit. 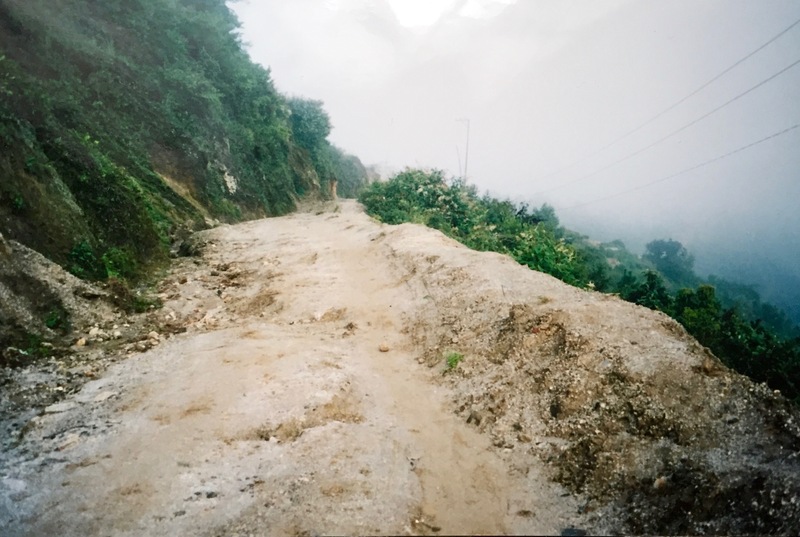 Raj Kumar Gurung said that instead of returning back to Pokhara the way we’d come up, he’d continue straight on past Deurali and meet the road in Naudanda. At this point, he was going to drive past my stop regardless. 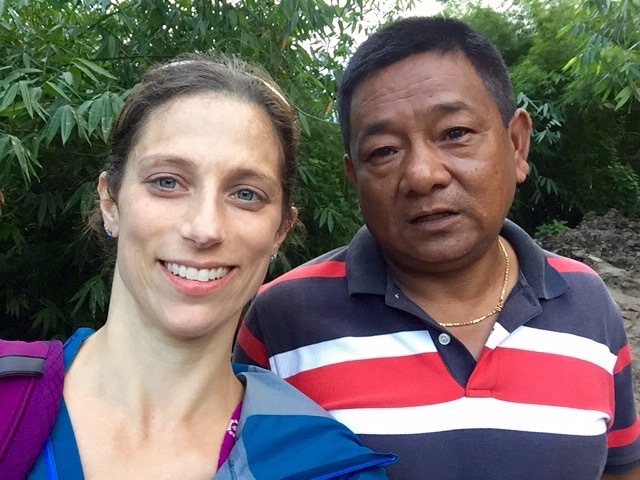 I decided to get off a half mile or so early to stop in and say hi to Thakur sir, one of our founding oral health program members, and I insisted that Raj Kumar Gurung at least have some tea before continuing on, but he demurred again. 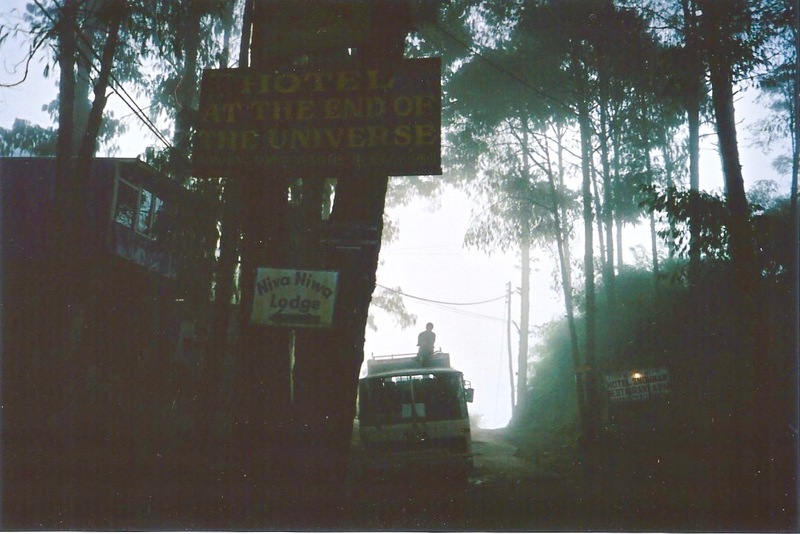 Off he sped, having lifted me directly from Lakeside to Kaskikot just as night was falling.